Mark Millar is giving us a glimpse into the future with "Old Man Logan," the big time current storyline in Wolverine. And, as seems to be the case any time an X-Men book turns its sights forward a few years, things could be a whole lot better. In this case, fifty years have gone by since the heroes lost their final battle. While the bad guys have divided up the United States in the years since that fateful day, the former heroes have either disappeared or submitted to their former enemies' rule. Logan counts himself among the latter. 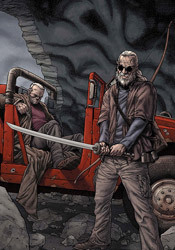 In "Old Man Logan," Millar has effectively captured the mood he was aiming for. Rather than a traditional superhero tale, this arc takes place on the spot Fistful of Dollars meets Mad Max. Whether it's Logan's staunch refusal to pop his claws or the low, defeated tone in which its characters speak, it's clear right from the onset that this is a different kind of story. With the narrative set so far into the future, Millar wastes no time in letting his readers know that the gloves are off, nothing is sacred and little can be assumed. His treatment of both Daredevil and the Punisher this month can attest to that. When this writer sets out to impress and surprise his readers, he delivers like few others. I must've grunted my appreciation for this fact a dozen different times this month, turning the page to be kicked right in the gut by yet another incredible, unexpected twist. With the slate effectively cleared, the story's central plotline gladly takes its readers on a bumpy ride across the unfamiliar countryside. The story's fresh take on familiar characters and exciting, young new faces are equally enthralling. We've known for years what these heroes looked like when they were in charge, things were going their way and nearly every adventure ended with the villains safely behind bars. How they look after the effects of a devastating loss with the highest of stakes… well, that's not so familiar. Great loss changes different people in different ways, and while its effects on many of these heroes may be initially shocking, they're also completely understandable. I've been a big fan of Steve McNiven's artwork since he took center stage in the primary Civil War mini-series. If you're familiar with his work during that run, then you should already know what to expect of his contributions here. McNiven's work is gorgeous, uber-descriptive but strangely organized. He's able to load a character or environment with an incredible level of detail, all the while introducing a firm sense of legibility and cleanliness to the proceedings. His characters show years' worth of scratches, scrapes, scabs and scars, perfect for the bleak prognosis Millar has painted for them here. Likewise, his backgrounds also show their age – in the decades since the baddies took over, there hasn't been a lot of room for fresh construction – and cry aloud for renovation. They look lived in, used and often abused, and that gives the issue a wealth of character. Mark Millar's storytelling is in top form with this arc, and Steve McNiven's artwork gives the book the visual punch and proven star power it needs to be successful. While this month's chapter absolutely screams by, it's not for lack of substance. I didn't feel ripped off, like the issue was purposely withholding content to pad the saga out a bit. There's just so much going on here at such a breakneck clip that I was merely disappointed I'd have to wait another thirty days for the action to commence. If the series has a flaw, it's that there's a whole heck of a lot of action and I worry that its conclusion will lack adequate depth, but that's a critique for another day. For now, this is a wild ride, a playground for both writer and illustrator, and a fine display of what can be done when Marvel's premiere characters are unshackled from the restraints of present continuity. Buy it up and catch up on the first two chapters if you've missed them. So far, so good.